Book listings on our website do not always reflect the current availability of books on our store shelves. Check a book's in-store availability beneath the "add to cart" button. Or to be certain that a book you've found on our website is also here on our shelves, feel free to call us at 615-953-2243. Kate Bowler is a professor at Duke Divinity School with a modest Christian upbringing, but she specializes in the study of the prosperity gospel, a creed that sees fortune as a blessing from God and misfortune as a mark of God’s disapproval. At thirty-five, everything in her life seems to point toward “blessing.” She is thriving in her job, married to her high school sweetheart, and loves life with her newborn son. Then she is diagnosed with stage IV colon cancer. The prospect of her own mortality forces Kate to realize that she has been tacitly subscribing to the prosperity gospel, living with the conviction that she can control the shape of her life with “a surge of determination.” Even as this type of Christianity celebrates the American can-do spirit, it implies that if you “can’t do” and succumb to illness or misfortune, you are a failure. Kate is very sick, and no amount of positive thinking will shrink her tumors. What does it mean to die, she wonders, in a society that insists everything happens for a reason? Kate is stripped of this certainty only to discover that without it, life is hard but beautiful in a way it never has been before. Frank and funny, dark and wise, Kate Bowler pulls the reader deeply into her life in an account she populates affectionately with a colorful, often hilarious retinue of friends, mega-church preachers, relatives, and doctors. 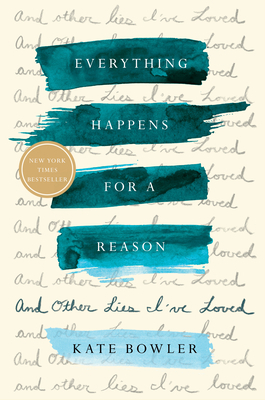 Everything Happens for a Reason tells her story, offering up her irreverent, hard-won observations on dying and the ways it has taught her to live. Kate Bowler is an assistant professor at Duke Divinity School. A graduate of Yale Divinity School and Duke University, Bowler is the author of Blessed: A History of the American Prosperity Gospel. She lives in North Carolina with her husband and son. If you have difficulty accessing content on this website, please contact us at orders@parnassusbooks.net and we will strive to assist you in accessing our website.